This flag is a modified banner of the district arms, lacking the canton filled with the Chuvash republic arms — both, flag and arms, were adopted on 2004.12.28. The latter are gules a traditional helm proper shifted from a pall or adextered. This results in an unusual arrangement, with a triangle standing on the fly edge, something expected to find when a flag is misrendered regarding the hoisting side; however, this one has indeed the “heavy” elements on the fly side, as this animation at the official website shows. Krasnoarmeyskiy district (Красноармейский район) is one of the 21 such divisions of Chuvashia (there’s also five district-status cities), in a relatively (by russian standards) densely populated rural area, halfway between Cheboksary and the railway hub town Kanash. 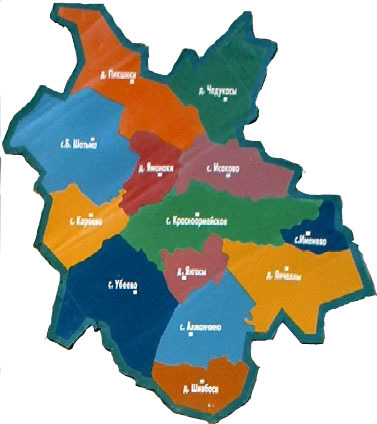 Krasnoarmeyskoye village (с. Красноармейское) is the (unincorporated) head of this county; the official website shows a map with the county’s 13 village councils’ territories.